Delivery man Jose Eric Flores loads the van. 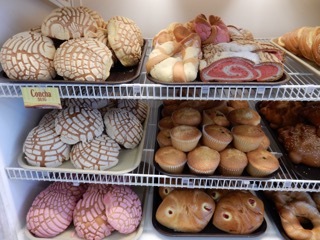 It’s Friday morning and boxes and bins fill every available surface at Las Delicias Bakery on Charlotte’s east side. Shell-shaped concha, brightened with slashes of colored sugar. Torpedo-like loaves of bolillo bread. Empanadas filled with pineapple jam. Piglet-shaped puerquitos. Oreja, like little elephant ears, crisp and mildly sweet to go with coffee. All are carefully packed for transport. Jose Eric Flores is loading the 2001 Toyota van for his twice-weekly run up I77 and into the little towns where Latinos are now a sizable presence. He’ll visit Esmeralda, a Mexican tienda (general store) in Mt. Airy. The model for Andy Griffith’s Mayberry, Mt. Airy is now nearly 10% Latino. Then he’ll swing over to Dos Rosas in Sparta, N.C., where Hispanics are the second largest ethnic group, 15% of the population, far ahead of African Americans. Crossing the border into Virginia there’s a stop at Jarochita in Galax, also 15% Latino. 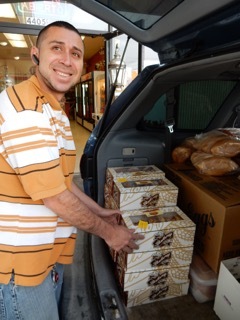 Manuel Betancur runs Las Delicias Bakery. Educated as a navy engineer, he fled his native Colombia during its decades of unrest. He met and married Zhenia Martinez, whose Mexican immigrant parents had started Las Delicias in Charlotte in 1997. Today regional sales comprise half of Las Delicias’s business. And Betancur is hoping to line up a loan to buy a second van. 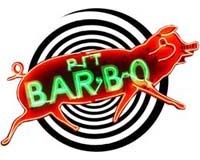 Monday – Sunday 6 a.m. – 10 p.m.